What helps their ability to push so many games is that the games themselves are usually of high quality for a mobile platform. Come to think of it, I can't recall a single one of their games that hasn't impressed me on some level. Usually the visuals are the most impressive aspect, due to the mobile platform. A close second is the controls, which, much like the graphics, are hard to do well on a touchscreen for more complex games. I had played Rival Knights some time ago. The game drew me in with the aforementioned visuals and compelling gameplay. Since then, Gameloft has released an expansion which adds in a slew of new features. But let's not get ahead of ourselves. What is the game about? There's a sparse story involving you being a newly appointed knight in a land whose lord has just perished. In order to keep the land from being taken over by debt collectors (a rival lord), it is up to you to win tournaments. There are five major tournaments consisting of five champions per tournament. After clearing each champion, a little more of the story is revealed. It's not much and there's no substance to it. It explains why you're doing what you are, but again, there's not much point. The gameplay consists of three modes, thanks to the expansion. The first mode used to be the only mode, jousting. By tapping on the screen at the right time, you gain speed boosts. Speed, combined with defense and attack make up the three values which determine the winner. Essentially, have two of the three better stats and you'll win. The speed stat is affected by the horse you're riding and the precision of your tapping during the charge. Attack is determined by the lance used and how accurate you are in aiming it. There are baseline stats, but they are greatly impacted by your performance. The meat of the game is based around the jousts. The two other modes are racing and archery. Since starting the game fresh on my tablet, I have yet to unlock the archery and am nearing the third champion in the first tournament. Racing is a straight forward affair which has you tapping to gain speed and swiping up to vault hurdles. It's simple, but breaks up the pace well. As you progress up the ladder, you will need to either purchase new equipment or upgrade your existing equipment. This includes lances, helms, armor, and horses. New gear can be purchased through gold won in matches or by gems which cost real money. There's no real option to grind for more cash, but the game is balanced enough (at least what I've played) to where I have yet to encounter any major difficulty spikes. To keep players from devouring the content too quickly, seals are required to play matches or PvP. They refill quickly enough, but are limited in number. So, if the loading times aren't that bad, you'll blow through all of your seals in 15 minutes. PvP is set up like the main jousting game, but will have players going against ghosts of one another. There are daily tournaments for PvP which reward gold and equipment depending or ranking. It's an addicting side game that keeps me playing more than I would like to admit. There's something so gratifying about working on your character throughout the day and coming out as the best in the world. Since it resets twice a day, it's easy for new players to jump in. Aside from the compelling gameplay, I am a huge fan of the visuals. Even when played on a phone, Rival Knights is slick. Granted, it doesn't approach Infinity Blade levels, but it's heads above what most other games offer. There's an incredible amount of detail in the player models and the horses they ride into battle. That being said, the update did add in NPCs which watch the match. The idea is to make the world come alive, but I think it detracts more than anything. The bystanders are just hideous as I don't think there's more than a dozen pixels among them. While the game does play well, I have experienced a lot of crashing on my Android tablet. I don't recall there being so many issues when playing on Windows Phone. At least four times over the course of a few hours, the game dumped outright, which always resulted in a loss. There are also moments of spotty hit detection where the game would mark a miss on my part, despite being relatively close to my mark. 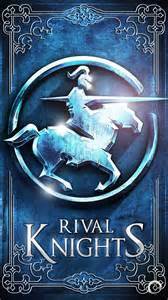 If you're looking for something out of the ordinary, are itching for a touch of the medieval, or simply want another game to kill time, I recommend Rival Knights. The mentioned issues are minor when compared to the otherwise excellent quality. The gameplay is addicting enough to keep you coming back. The constant progression makes it easy to play over long periods of time where other games may die out.